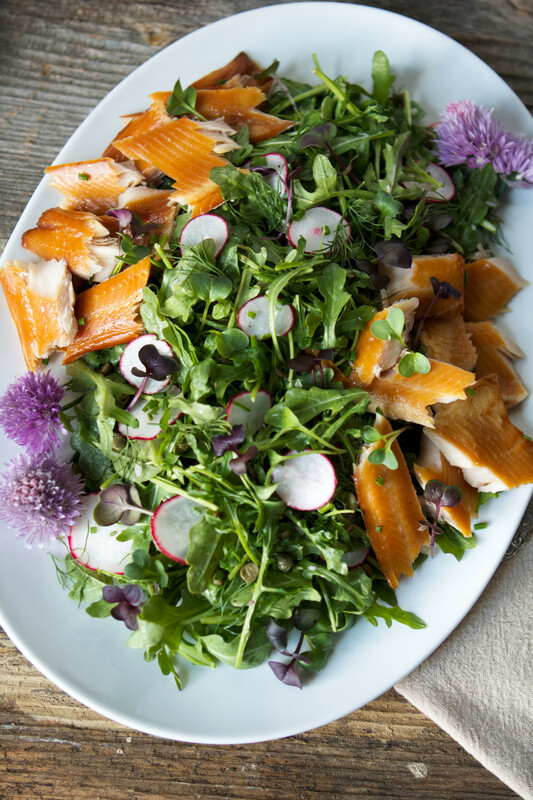 Smoked trout salad! This bold-flavored salad is one of my all-time favorite recipes. 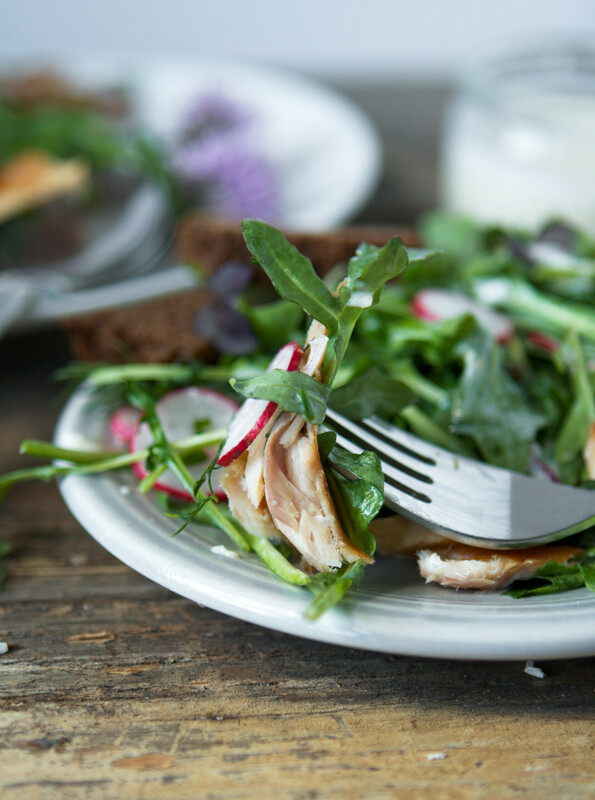 Made with arugula, radishes, microgreens, and smoked trout, this green salad is at the top when it comes to the best spring and summer salads. On the most gorgeous spring evenings last week I stopped by Dogpatch Urban Gardens and met the owner and farmer, Jenny Quiner. I would be lying if I said I didn’t think this was the coolest thing I’ve seen in Des Moines for a while. Not in the middle of nowhere and not hard to find, D.U.G is North of Beaverdale in the middle of a neighborhood. Just off the road, you’re able see rows of gorgeous produce along with a newly constructed high tunnel which will allow them to extend their growing season from March through December. Jenny and her husband, Eric, opened D.U.G. in the fall of 2015 which has been gaining popularity and momentum ever since. I now understand why. Jenny’s greens are simply stunning. As the sun was setting, I stood on the edge of her large garden and marveled at the uniform rows of vibrant greens, radishes, microgreens, and recently added, edible flowers (DSM chefs and food bloggers is your curiosity spiked?). Not far from the fenced garden is the D.U.G. farmstand, which continually draws people week after week. Des Moines has needed a destination like this. With just one stop you can support not only one small scale producer, you can support many. Among their own produce, the D.U.G farmstand offers local honey, jam, eggs, dairy and meat products, grains, hand-crafted wood spoons, and more. These kinds of operations litter the area around Boston, which is one of the many reasons why I absolutely adored living there, and another reason why I enjoy watching and experiencing the DSM area grow. Businesses like these are what turn a city into a community, a destination for people to live and collaborate in. I am incredibly excited to support this local urban farm and to get on board with their mission of focusing on community, health, nutrition, environmental conservation, and as Jenny says, “growing food, not lawns”. As I left, I told Jenny I was going to bring all of my family and friends to D.U.G., and I wasn’t joking. I love stopping by the Farmers’ Market on Saturday morning, that won’t change. But I’m excited to frequent D.U.G. 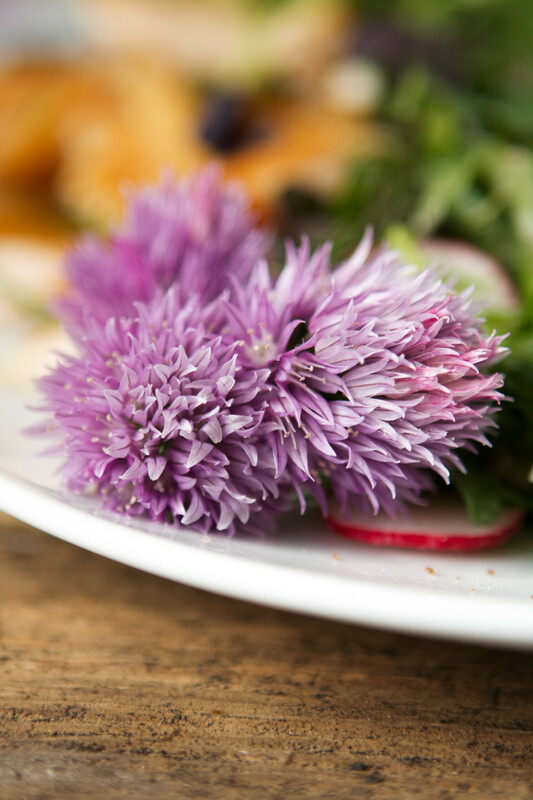 (or sign up for their salad subscription box) and see what they have to offer with the changing seasons. There’s just something about fostering a relationship with local growers and produces—where food really is farm to table. It just doesn’t get any healthier or fresher than that. 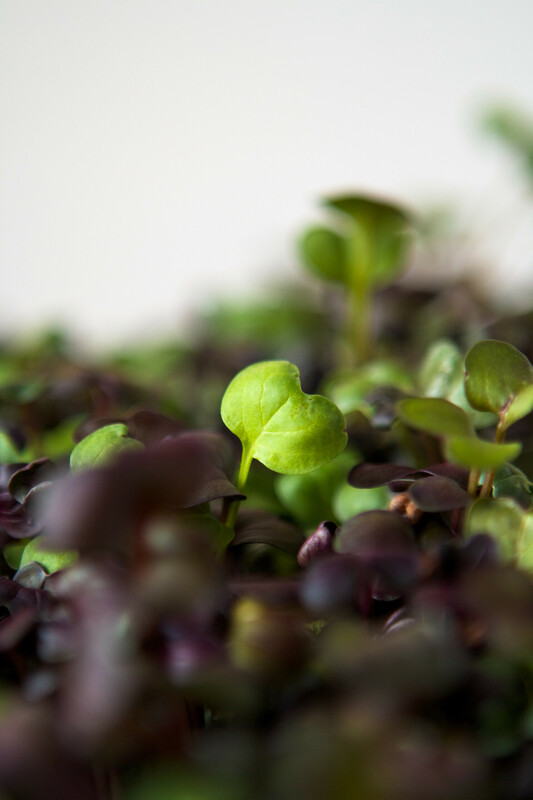 Jenny’s Red Rambo Microgreens pair perfectly with this bold salad. 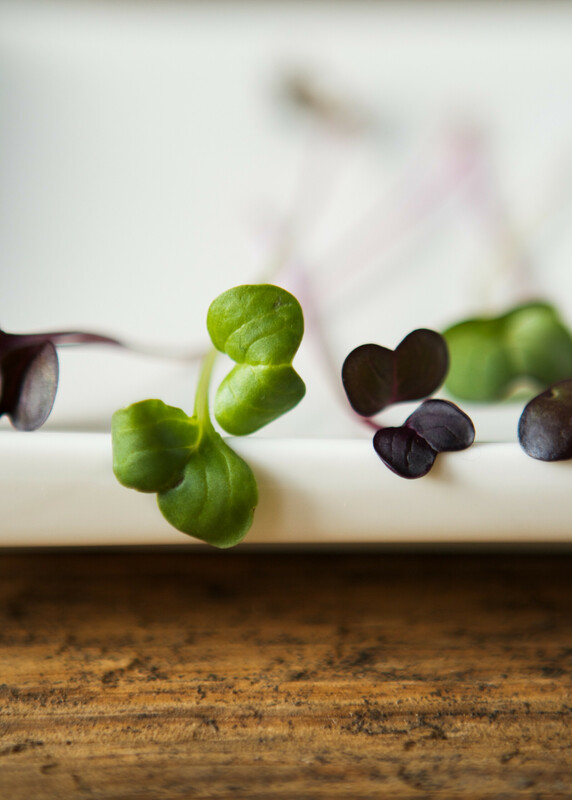 Like most microgreens, this particular type has a tender, delicate texture (and are packed with tons of vitamins). 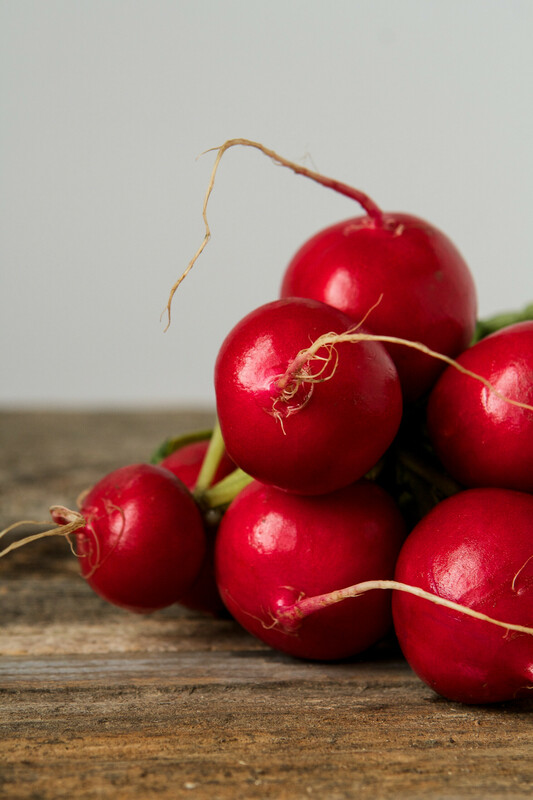 But unlike other microgreens, the Red Rambo Radish variety has a peppery bite. 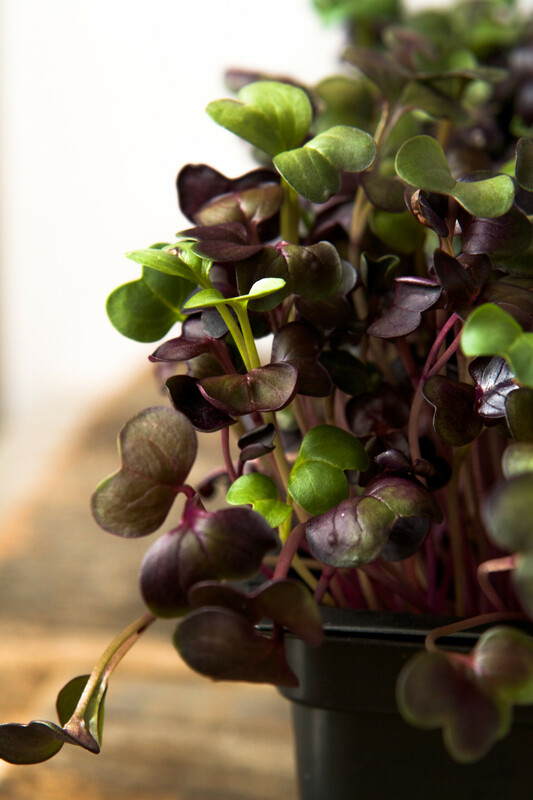 Deep-purple sprouts are intermixed with vibrant green ones to offer beautiful color to any dish you use them in. 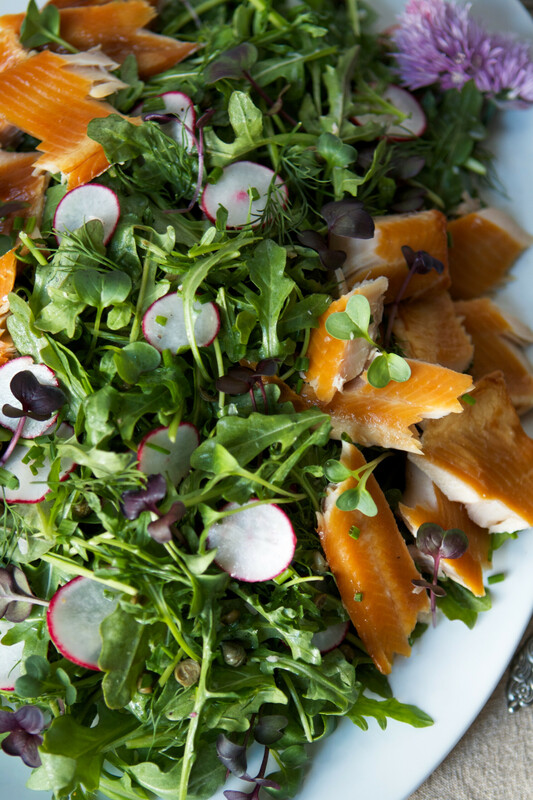 I’ve been wanting to share a smoked trout recipe for a while and these peppery microgreens counteract the bold-savoriness of the smoked fish. Both of these ingredients pack a ton of flavor into rather small packages. 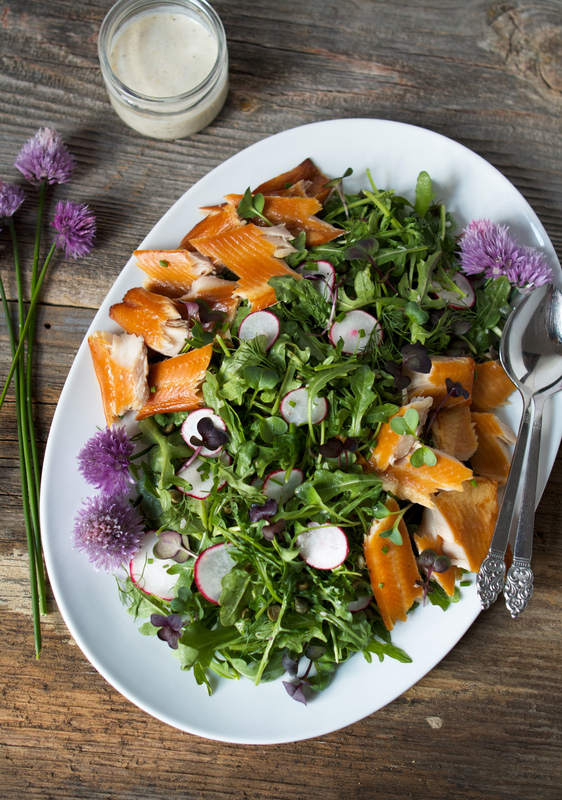 The rest of this salad is composed of spring and summer staples; radishes, chives, dill, and arugula. 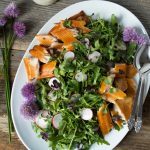 Then tossed with a light Horseradish–Yogurt Dressing, this salad is satisfying as a starter for four or as an entrée for two. I’ve gotten a few questions regarding smoked trout, so I thought I would address them! Yes! 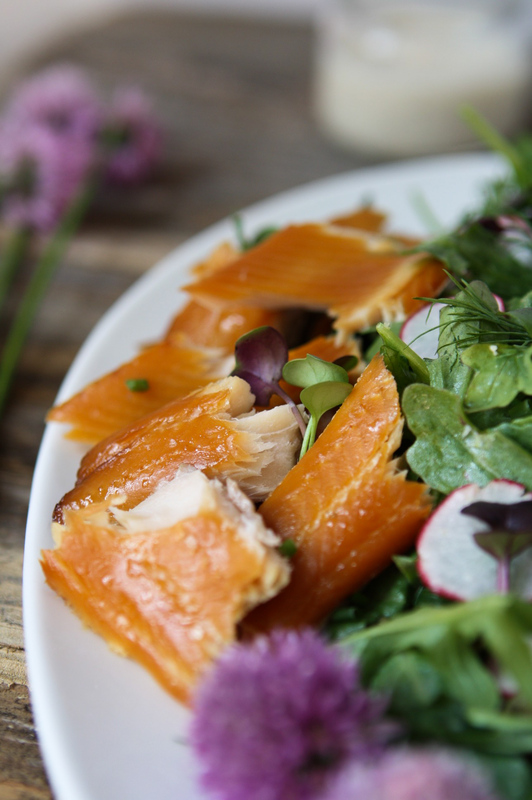 Smoked trout is cooked just like smoked salmon is, so you’re safe to eat it right out of the package. How else can you serve smoked trout? Using smoked trout in place of deli meat in sandwiches and wraps. Where can you buy smoked trout? Not all major supermarkets carry smoked trout, so I recommend calling a few stores around you before you head out searching. I’ve had good luck at smaller, specialty grocery stores, but some larger stores do carry it every so often. Most often, smoked trout will be found with the smoked salmon which is usually in the cheese/deli area or at the seafood counter. 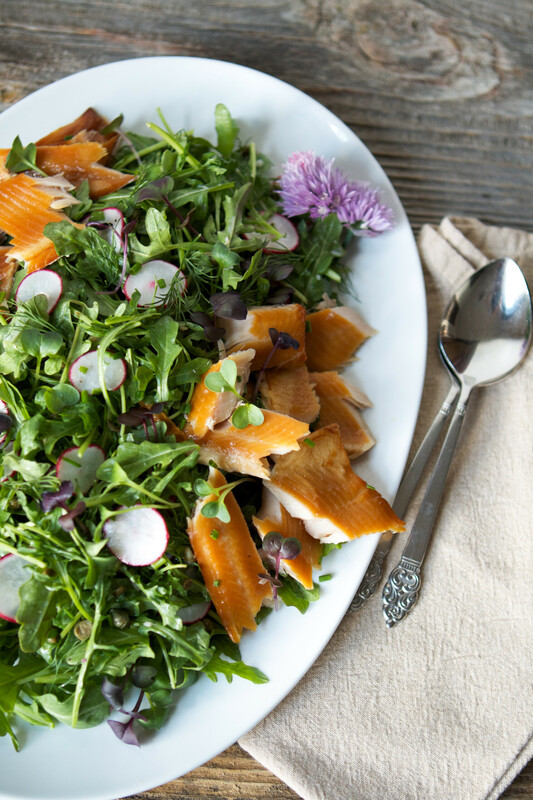 Smoked trout is the star of the show in this fresh green salad. 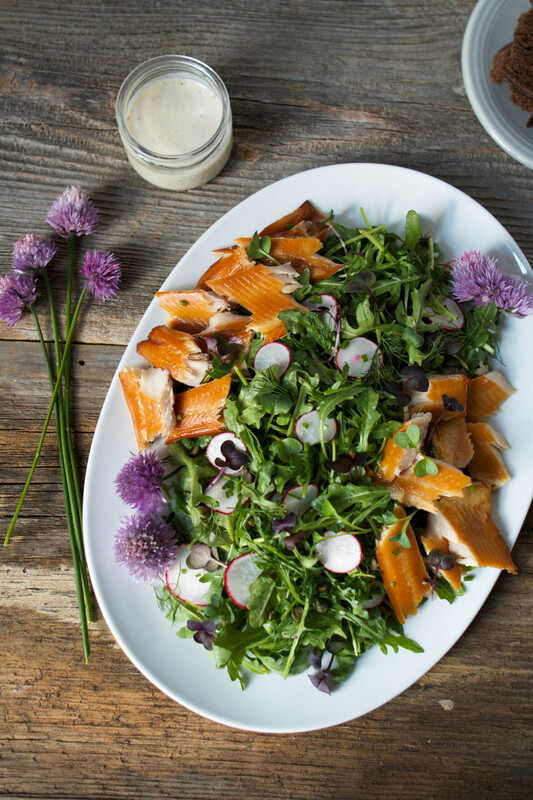 Tossed with a healthy creamy horseradish dressing, this bold-flavored salad is spectacular! Whisk together yogurt, oil, vinegar, shallot, horseradish, salt, zest, and honey; season with black pepper. 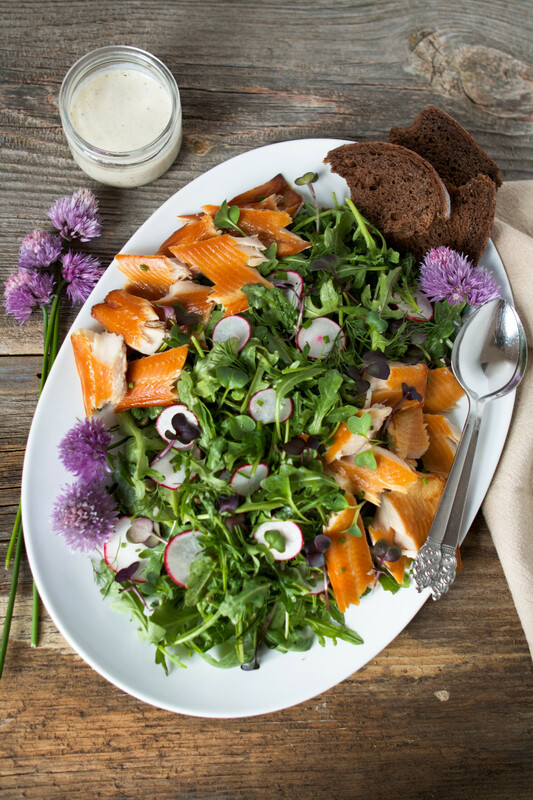 In a large bowl toss arugula, radishes, chives, dill, and capers with half of the dressing. 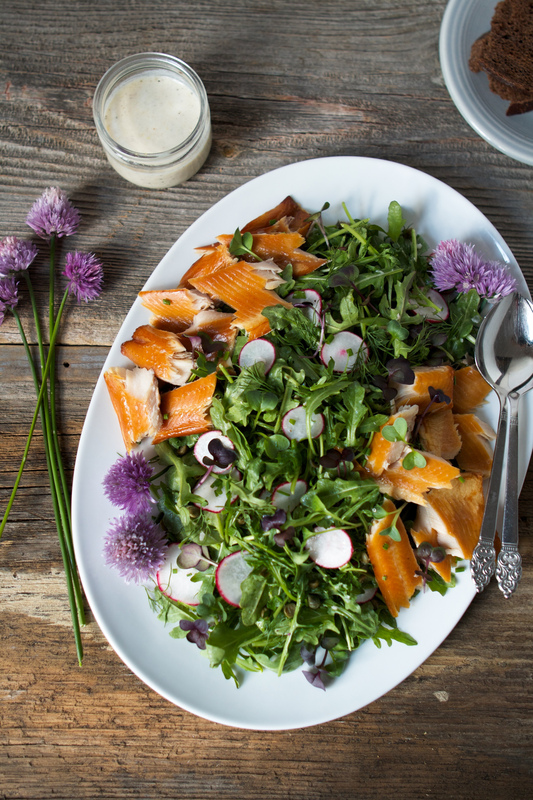 Transfer salad to a serving platter, arrange trout around edges, and drizzle with remaining dressing. 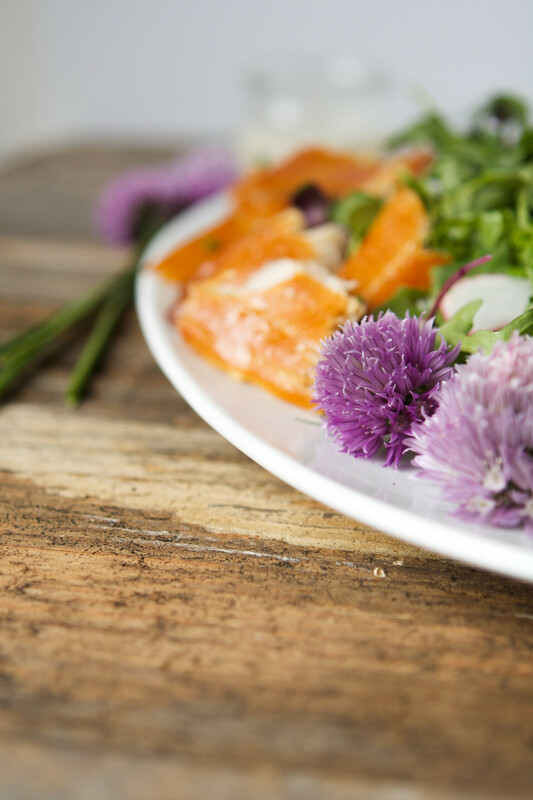 Garnish salad with microgreens and chives blossoms. Look for prepared horseradish in the refrigerated deli area, you don’t want the creamy horseradish spread found near the ketchup and mustard. Serve with a few chunks of dark rye bread and a glass of Garnacha Rosé or sparkling wine. That urban farm sounds amazing!! I love that it is right in the middle of a neighborhood. SO cool. And this salad?! Well, I have a thing for smoked fish. Yum! !